Today there are plenty of apps that are aimed at tracking any type of activity from sleeping to eating to molding your muffin top to six pack abs. But despite the tracking hype, sometimes it turns into some sort of a quest to find the app that fits your personal needs and does something more meaningful than show you graphs and stats. Even if you’re lucky to find that app, it’s still not perfect because you have to complete your user profile with all the data required, not to mention that some of it can be really useless for that certain app. Inspired by Google Fit customizable animation I made up my mind to create my own meaningful Eat Fit animated component for an activity tracking app. I used After Effects to create it, probably because I don’t like taking the easy road. I believe that this simple animation will inspire you to make your own great activity tracking apps that will help thousands of people become fit and happy. Luckily, we’ve got the Swift coding part wrapped and ready thanks to Aleksey Chernish, our iOS developer. Now let’s find out how great design ideas turn into something you can actually touch and feel (if you have an iPhone, that is). Since we’re building a fully customizable component, thickness of charts should be also adjustable. Below you can see the structure of the component in terms of iOS SDK. Component itself is ChartPagingViewController. Inside there is a custom paging control ChartPageControl and a child page view controller. Each page is a view controller or ChartSlideViewController. To display each part I used different views that encapsulate specific animation logic. Each view animates with a certain delay. Presetting those delays helped me a lot at the final cut stage when I needed to synchronize all animations. Drop is an instance of UIBrezierPath that changes its position with a custom timing function. If you’re wondering how a circle transforms into a logo let’s take a look at the slow-mo version. As you can see, there’s no magic there. By reducing a circle’s size, the logo is getting bigger. When the speed is high enough it smoothly transforms its shape. Chart is CAShapeLayer, which applies UIBezierPath as a ‘path’ property. To make chart move along the path I used the ‘strokeEnd’ property of the layer. The CALayer allows you to adjust line tips with the lineCap property. For our particular case I made them round. As you can see, the text shows up on the screen as if it’s created using a typewriter. I achieved this effect by applying attributed text to the UILabel. By the start of the animation all text has a clear color. Then, by making the text black gradually, symbol by symbol, with a specific delay, I made the whole text visible. This animation represents a very interesting case where you have to animate something that cannot be animated. Core Animation and UIKit give us a really wide set of tools to animate ‘displayed’ properties of objects such as opacity, location on the screen, scale, rotation, and so on. All these parameters can be continuously changed using timing functions, bounces, and more. But what if we needed to animate something that’s not displayed, like % done against goal which is represented by NSString? CALayer can help us with that. Below we’ll implement a handy Tween class that continuously updates the value for a key of a given object. Tween will encapsulate interaction with an animated object. Therefore, all the actual work will be performed by TweenLayer. private weak var layer: TweenLayer! From, to and duration options belong to the layer, so we’ll pass them later. Create a method that starts the animation and leave it blank for now. It’s quite clear that to define the animation, we need starting and ending values, duration, timing function, and delay. Let’s add one more property. It’s very important. This property will smoothly change it’s value. By declaring it as @NSManaged, we pass control over the real value hidden behind the property declaration to CoreAnimation. Here we created and set up the animation for our property. Also, we assigned 'self' as an animation’s delegate. But according to the CAAnimation Class Reference, there’s no delegate protocol. Furthermore, it’s one of the rare cases when a delegate is retained by the object. Pay attention that the layer is a weak property and no one can guarantee that it won’t be destroyed during the setup if we don’t use block. The actual retention happens only when the layer is added as a sublayer to the object’s layer. Also, let’s add a computed property timingFunction to the Tween class. It’ll represent the same property of the layer. In the first method we finally assigned intermediate values to the object’s modified property. In the second method we made a clean up when the animation is finished. Some may ask why the property that requires animation isn’t necessarily CGFloat. Well, let’s add a mapper property to the Tween class. The Mapper will transform an intermediate float value into the value of the type we need. var mapper: ((value: CGFloat) -> (AnyObject))? Ready! Now we can test our Tween class on the label that we created at the beginning of the tutorial. You might be curious why Tween stays alive after the viewDidAppear method execution is finished. Well, let’s look at the retain scheme. Tween itself doesn’t bind its lifetime with a given object. Besides, we should remember that the layer is a weak property of Tween. However, when we create a layer property, we insert it into the object’s layer hierarchy that keeps the layer alive. Pay attention that animationDelegate property of TweenLayer isn’t declared as weak. Because of this Tween is held in the memory by TweenLayer. When the animation is over, Tween receives a callback from its layer, and removes this layer from the layers’ hierarchy. This leads to the layer’s deallocation, and consequently the Tween (that was held in memory by the layer) gets released as well. Check out: How much does it cost to build an app? In conclusion, I’d like to say that the main challenge in the project was implementing the possibility for a user to customize the animation. After all, animating graphs and images isn’t enough, I had to provide the user with a full control over content. 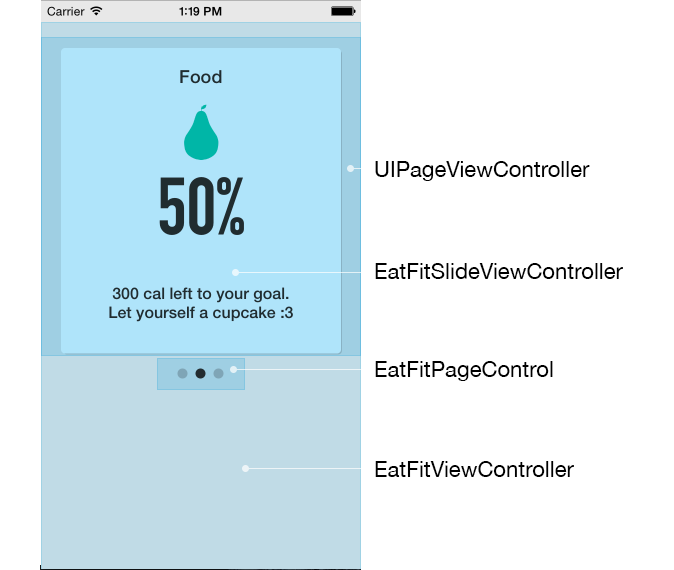 Eat Fit customization is similar to working with UITableView: you need to pass the total number of pages and parameters for each page: text, color, image, and so on. Eat Fit is undoubtedly, a flexible component and during its development I learned to think not only about the code, but about how the animation will be perceived and used.